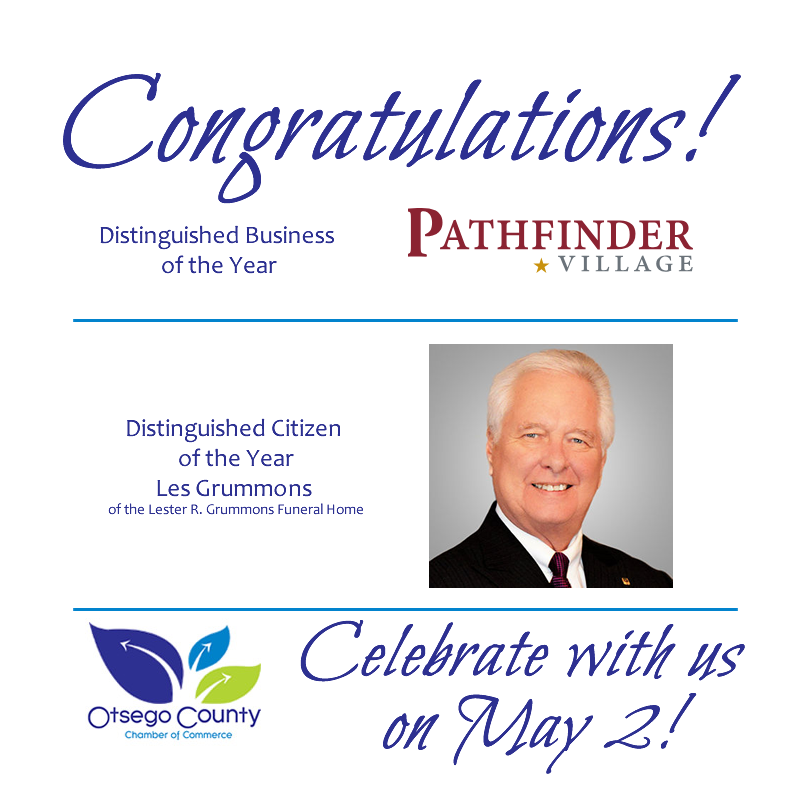 The Otsego County Chamber of Commerce is excited to announce a celebration of the county’s spirit as we recognize the Distinguished Business and Citizen of Year on Thursday, May 2, 2019 beginning at 5:45 p.m. at The Foothills Performing Arts and Civic Center in the Wright/Wilber National Bank Atrium. Pathfinder Village is the recipient of the Distinguished Business of the Year Award sponsored by NBT Bank. Pathfinder Village is a unique organization with a four decades-long commitment to providing community based, highly individualized services to resident/students/day service members, allowing them to grow in skills attainment and independence and to foster opportunities for new interests and wider circles of acquaintances. In 1996, Pathfinder Village opened its Kennedy Willis Center, its outreach, training, life planning and research arm, which supports people with developmental disabilities and their families through workshops, seminars and a conference on topics related to Down Syndrome and other developmental disabilities. In recent years, Pathfinder Village has taken a regional leadership role in bringing workforce issues to the forefront and working with local and national partners to model staffing solutions for the non-profit/human service sector. The organization also developed a thriving niche business, Pathfinder Produce, that meets the fresh-produce needs of families in rural parts of the county, as part of local collaborative community health efforts. Additionally, Pathfinder Village has created services to provide greater support and appropriate residential care settings for older persons with Down Syndrome. The organization has also partnered with leading researchers and best-practice groups to provide training for direct support staff working with older individuals with dementia. The Distinguished Business of the Year is awarded to companies with 50 employees or more that demonstrate resilience, courage and commitment and the ability to find new solutions and working space. With more than 200 employees, Pathfinder Village has brought recognition to our region as it fulfills its role as a leading human services agency and advocate for people living with Down Syndrome and other developmental disabilities. In Oneonta his commitments have included being the main organizing force behind the Memorial Day Parade; being elected for four years as 8th Ward Alderman on the Common Council; serving on boards for Catholic Charities, St. Mary’s Church and most recently Catskill Area Hospice and Palliative Care Board; and never missing any Hospice event. As an airport commissioner, Les Grummons assisted with the Oneonta Municipal Airport’s 50th Anniversary. Les has the soul of a committed volunteer, and he makes the community a better place to live and work. We are proud to honor both Pathfinder Village and Les Grummons, as deserving recipients of these awards. The Chamber’s business awards have showcased some of Otsego County’s best business talent, since 1999. Our May 2 event theme is “Top Hats and Tiaras,” and you are encouraged to dress in black or white business attire. Bring your favorite top hat or tiara or choose from those we will have available at the tables to add extra sparkle to the evening. We look forward to welcoming you to this celebratory event. The formal invite and reservations will be available on Monday, April 1, 2019. Please join me in congratulating these distinguished award honorees!